Clippership | Integrated Systems Associates, Inc.
Clippership® (developed by Kewill, Inc.) is one of the most widely deployed and recognized shipping solutions on the market today. This powerful PC-based solution enables organizations to ship with multiple carriers from one application, eliminating dedicated workstations for each carrier. When used in conjunction with Kewill.Integrate (KI), an object-oriented integration tool, Clippership can be highly customized to integrate with virtually any back office, order management or WMS system, enabling users to streamline the order fulfillment process. All the above software is site-licensed and multiple Clippership workstations can share the same shipment information from one central network location. Clippership also allows for multiple shipper accounts so that each of your sub-companies can bill through their own respective carrier accounts. Our in-house engineers have been installing & customizing Clippership systems for over two decades and have automated its shipping functions into numerous interfaces. 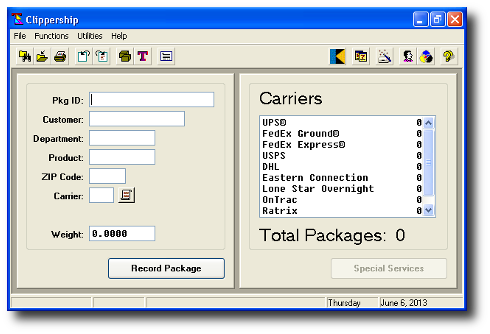 Integrated Systems can add virtually any small parcel carrier or LTL/LT carrier to Clippership as needed. Please call for details. Internet postage vendors are taking over the shipping industry by storm by offering low cost shipping rates and providing house level address validation. Our company is an Integrated Partner with two of the major vendors - Stamps.com & Endicia - and has developed a set of tools to seamlessly integrate their services into Clippership. Learn how these vendors can help your company save on shipping costs. Kewill is a leading provider of software solutions that enable enterprises and logistics providers to manage the movement of goods and information across the globe. We deliver innovative software for business-critical global supply chain requirements through our three product suites: Logistics, to support freight forwarding, transport, warehousing and customs compliance; Transportation and Shipping, to enable parcel, LTL, TL and desktop shipping and export trade compliance, and; Business to Business Integration, to drive B2B eCommerce, order management and supply chain integration. KI is an integration tool that enables programmers to enhance Clippership functionality. With KI, shipment information may be shared between Clippership and virtually any host ERP, WMS or accounting system.